I'm happy to share a new dress I just finished for the holidays. Big confession though: I didn't make it because I was feeling super crafty, or wanted to get all handmade this year. It's because I'm a total cheapskate. I love fabulous, vintage style dresses on sites like ModCloth, but the prices are just crazy. No way am I going to pay around $100 for a whimsical Christmas dress, no matter how much I want it! My solution: Make my own on the cheap. 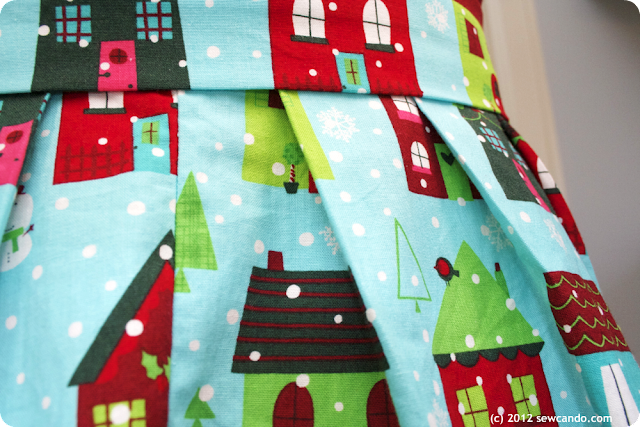 I snagged the ideal pattern, Simplicity 4070 (at a mere 99 cents on sale), a few yards of the adorable O Tinsel Tree Snowy Houses fabric (by Pink Light Design for Robert Kaufman) and a zipper, all for under $30. I used some leftover muslin for the lining. I chose view A of the pattern, but used quilting cotton instead of the recommended silk/satins. And since I was using a directional print, it took a bit of careful layout planning to cut the bodice pieces so the houses would line up in the right rows, but I think it worked out just right. This was one of those rare instances when the dress I envisioned really came to life in both style and fit. 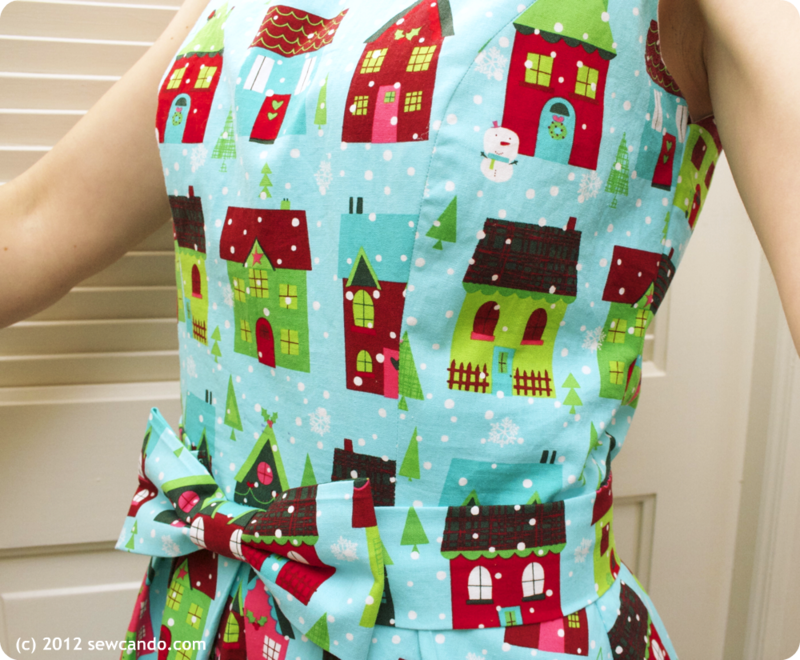 I am really looking forward to wearing it for Christmas and will definitely be using this pattern to make more cute dresses on the cheap. Take that Mod Cloth prices! I love it! The fabric is great too! I think this is a pattern I was looking at, is the dress black on the pattern? Except use a coupon or wait for a sale so you don't have to pay $10 for it! Thanks Becca - that's the ultimate compliment! that' like the perfect holiday housewife look, lol. super cute! Thanks Charity and I'm glad I'm not the only one who thinks that! This dress is too cute for words. Love the bow. Aw thanks - I agree on the bow - it's funny how something so simple adds so much. That's just so cute! You're all ready for the holidays now! I can see your crafty attention to the details...perfect! Thank you so much for joining us for Pearls and Lace Thursday! Thank you so much Doni. It's a real first for me to be ready this early, so I'm pretty proud! Adorable! I think I might just have to go make myself one now. I'm super into modcloth's dress with the winter scene at the bottom; maybe I can find some fabric online to make it. P.S. I'm coming by way of 504 Main's link party, and am totally pinning this post. That's one of the dresses that inspired me Grace! It looked so cute, but when I saw it on someone it kind of had a converted tablecloth look I knew I couldn't pull off in real life. I'm definitely going to do a dress with a back like that one though - the circle opening with the tie is gorgeous. Keep an eye out for it in a post in 2013! 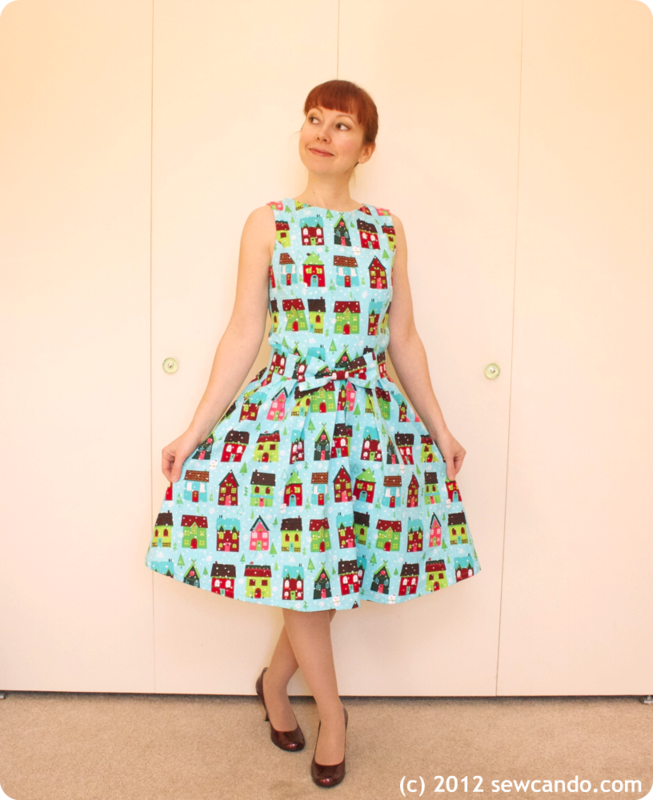 That is just the most adorable dress, and the cutest fabric. Not to mention: that model: lovely! Crystelle you are too kind!! I love your beautiful dress!!!!!!!! A very flattering, feminine style of dress, Cheryl!!! My mother used to wear dresses in this style, but with a plain belt, in the 50s and 60s. If you had shown me the pattern and the fabric before sewing, I would have said, 'No way.' But it totally works!!! A fabulous dress!!! What a perfect holiday dress. It is absolutley adorable! Ohh, it`s so great...so very wonderful dress! Well aren't you sassy! Love it! Fun! That is ridiculously cute! So adorable. I love this! I'm usually not a pattern kinda girl. But this IS the perfect vintage looking dress. Love the fabric! Just stropping over from Threading My Way. The pattern is Simplicity 4070. You can get it on their site or in most fabric stores. I really LOVE this dress! Great pattern! You did an awesome job! It's adorable and looks so crisp and polished, as nice as anything from a store if not better. Aw, Bonny that's the ultimate compliment thank you!! wow I LOVE it. 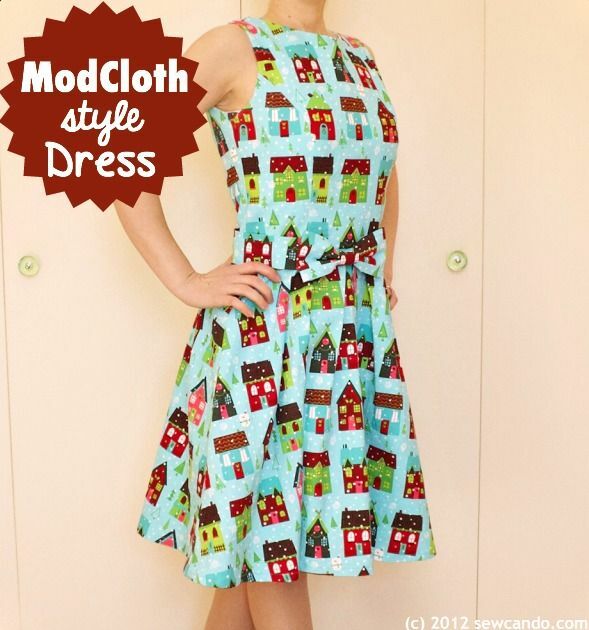 Ive been eying many of the cute dresses on modcloth too! Wish I could afford them, or new how to sew my own like you! LOVE this!! This dress is adorable! I would love to be able to sew like that. Very cute! I love that fabric! Well, stop calling yourself a cheapskate: this is a million dollar dress! Thank you for linking it up at http://www.finecraftguild.com . wow this is incredible! 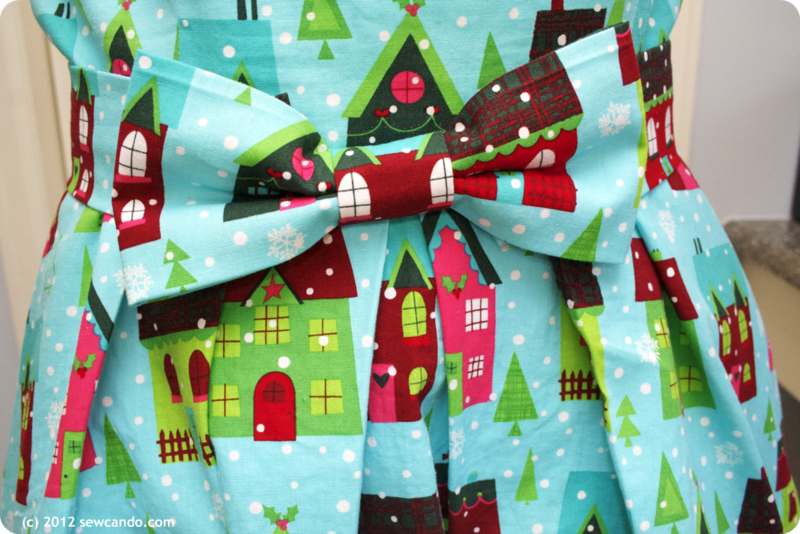 The perfect christmas dress! We love your creative idea and appreciate you taking the time to share it with us in the Crafty Showcase. Stop back in to see who gets featured on Friday. Just to let you know I featured your wonderful project today. Stop by and grab a featured button. wow what a beautifull dress you made!! Words cannot express how much I adore this! Oh my word. I love it! I love it! I want to make dresses now! What a great surprise Amy. It makes me feel so famous! That is wonderful to hear Becca! I'll be checking it out!! Brilliant. I am blown away that you took an evening dress pattern and not only made a day dress from it, but a gorgeous one at that.